Promenade Dress,1809, from Ackermann's The Repository of Arts, Literature, Commerce, Manufactures, Fashion, and Politics, 1809-1829. This dress is very like many morning dresses. It is of white muslin with a long violet perline or short cape over it. The perline is trimmed with lace and a lace veil covers the lady's head. She carries a parasol to protect herself from the sun and preserve the desirable pale white skin color. 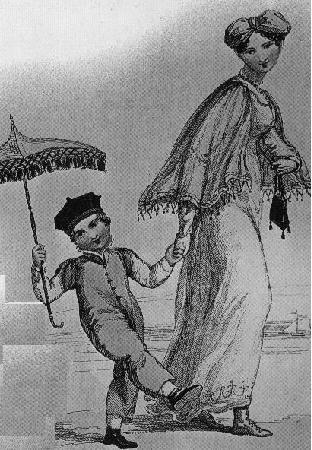 Promenade Dresses for mother and son, 1811, from Ackermann's The Repository of Arts, Literature, Commerce, Manufactures, Fashion, and Politics, 1809-1829. Note the exotic eastern flare of the child's hat and buttons. The mother's parasol, shawl, and reticule have fringed trim on them. The mother's turban also reflects the fad for exotic eastern styles. Promenade Dresses,1813, from John Bell's La Belle Assemblee, or Bell's Court and Fashionable Magazine Addressed Particularly to the Ladies (1806-1868). The two ladies stroll through a garden in simple, plain gowns tied under the breasts with sashes. 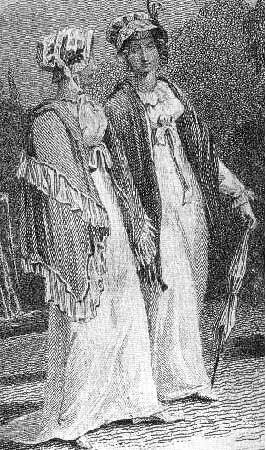 The lady on the left wears a short ruffled cape over her gown, while the lady on the right wears a shawl and carries a parasol. Both dresses are cut rather high.